Lock in a great price for Grand Hyatt Macau – rated 9.1 by recent guests! 3 nights in their Executive Club Suite exceeded my expectations! Very large bathroom with free standing spa tub, and separate bedroom and living room. International electrical plugins and very fast Wifi. Kettle and coffee machine provided. Huge international cable TV selection! Well stocked mini bar and snacks for purchase. Shower had plenty of hot water and excellent water pressure! Breakfast buffet had good variety and eggs cooked to order by friendly staff. Buffet had a coffee station and a bakery! Casino was busy! The attached shopping mall had many upscale stores and a food court. The Wynn Palace and MGM hotels are across the street on opposite corners. The staff were well trained and very friendly especially housekeeping! We really enjoyed our stay, the room was beautifully decorated and the beds were comfortable. Everything was clean and the staff was very thoughtful and attended to our needs. We were celebrating a birthday and they prepared something special. Thank you! Excellent facilities, beautiful and spacious rooms in a great location. Perfect if you aim for a slightly smaller hotel in Macau where you don’t get lost while trying to find your room. Hotel is centrally located at Cotai Strip, where the major gambling action takes place in Macau. The location of the hotel means short walking access to big casino operators nearby such as Venetian Macau, Parisian Macau, MGM Macau. I personnally like the ambience and duty-free shopping experience in City of Dreams where Grand Hyatt is located in. There are also free shuttle bus between the major casinos in Cotai Strip. the staffs were awesome.. especially Mr. Sigit, Ms. Peggy and Ms. Tina Yu.. they were so helpful and kind during our stay and thanks for the cake for my hubby's birthday.. perfect location.. we enjoyed our stay.. thank you.. The hotel is very close to airport, Venetian and Wynn Palace. All above places are easily to access by walk. The room view is fantastic which can see the planes take off and land clearly. Btw, the mezza9 buffet is a MUST try restaurant. Grand Hyatt Macau This rating is a reflection of how the property compares to the industry standard when it comes to price, facilities and services available. It's based on a self-evaluation by the property. Use this rating to help choose your stay! One of our top picks in Macau – and a guest favorite. The modern rooms at the Macau Grand Hyatt come with city or river views. They include a 42-inch flat-screen TV and spacious twin basin bathrooms with a rainshower. Guests can walk in the outdoor garden, enjoy a treatment at Isala Spa, or relax in the steam room or bubble bath. The Grand Hyatt offers private pool-side huts. Grand Macau Hyatt features 5 restaurants, a bar and a lounge. The Beijing Kitchen serves Northern Chinese specialties, while Mezza9 offers Macanese dishes. The Grand Hyatt Macau is a 5 minute drive from the Taipa Ferry Terminals. The free City of Dreams shuttle service drives between the airport, the ferry terminals and the hotel. 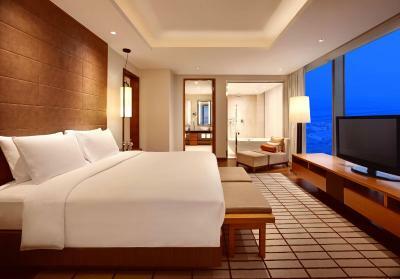 When would you like to stay at Grand Hyatt Macau? Located in the dedicated Grand Club Tower with floor- to-ceiling windows, this room offers contemporary decor, a king bed, sculptured bath and rainshower, overlooking the Cotai or Pearl River Delta west bank. Guests who book the breakfast & dinner package can also enjoy free mini-bar (nonalcoholic drinks only) and 50% off for laundry services per stay. Located in the dedicated Grand Club Tower with floor- to-ceiling windows, this room offers contemporary decor, 2 single beds, sculptured bath and rainshower overlooking the Cotai or Pearl River Delta west bank. Located in the Grand Club Tower, this suite offers plush king bedroom and marble master bath with separate tub and shower, living room, kitchenette and dining area with table for 6. Enjoy panoramic river or city views, plus amenities such as flat-screen LCD TV, wireless Internet and access to the Grand Club for complimentary breakfast and cocktails. The room comes with a 24-hour butler service. Featuring floor-to-ceiling windows overlooking the Cotai or Pearl River Delta west bank, this room offers contemporary decor, a king bed, sculptured bath and rainshower. Featuring floor-to-ceiling windows overlooking the Cotai or Pearl River Delta west bank, this room offers contemporary decor, 2 double beds, sculptured bath and rainshower. Featuring floor-to-ceiling windows with expansive views over the Cotai and Pearl River Delta west bank, this suite offers plenty of space for entertainment, a dining table, a branded coffee machine and a living room with a seating lounge for 5. Featuring floor-to-ceiling windows, this spacious suite offers plenty of space for entertainment, separate living room and bar. The master bedroom includes a king bed and an adjacent bathroom with a separate bath and walk-in rainshower. Featuring floor-to-ceiling windows, this spacious suite offers plenty of space for entertainment, separate living room and bar. The master bedroom includes 2 double beds and an adjacent bathroom with a separate bath and walk-in rainshower. Located in the Grand Club Tower, this suite offers features floor-to-ceiling windows overlooks the Pearl River Delta west bank. It includes a king-size bed, sculptured bath and rainshower facilities. The living room comes with a dining table, branded coffee machine and seating for 5. Featuring spectacular of its kind fountain views, this oversize 52-square-yard room has floor-to-ceiling windows. Overlooking the expansive views of the Cotai skyline, the room offers plenty of space for entertainment. The living room has a dining table and a seating lounge for 5. Featuring spectacular of its kind fountain views, this spacious 64-square-yard room comes with floor-to-ceiling windows, separate living room and bar offers plenty of space for entertainment. The master bedroom has a king-size bed and an adjacent bathroom with separate bath and walk-in rainshower facilities. Featuring spectacular of its kind fountain views, this spacious 64-square-yard room comes with floor-to-ceiling windows, separate living room and bar offers plenty of space for entertainment. The master bedroom has 2 double beds and an adjacent bathroom with separate bath and walk-in rainshower facilities. Featuring spectacular of its kind fountain views, this oversize 69-square-yard room has floor-to-ceiling windows. Overlooking the expansive views of the Cotai skyline, the room offers plenty of space for entertainment. The living room has a dining table and a seating lounge for 5. This triple room has a electric kettle, cable TV and sofa. This suite has a satellite TV, bathrobe and mini-bar. House Rules Grand Hyatt Macau takes special requests – add in the next step! Grand Hyatt Macau accepts these cards and reserves the right to temporarily hold an amount prior to arrival.